After a rough two decades for Kuwait Airways, there are signs that the carrier could be finally at the beginning of a major turn-around. The decks are cleared for a new take-off. In Jan-2013 the Kuwait parliament gave its final sign-off for the carrier’s privatisation legislation and agreed to pay off its heavy losses. An agreement on fleet renewal, at least a decade overdue, appears to be close to fruition after the failure of several agreements in recent years. And the airline has also settled its long-running dispute with Iraqi Airways over war reparations, with a USD500 million settlement also ratified by the Kuwaiti National Assembly. Kuwait Airways has been one of the perennial loss-makers of Gulf aviation. Since suffering the loss of most of its aircraft, engines and spares in the Iraqi invasion of Kuwait in 1990, it has managed just a single year of profit. Losses for FY0211-2012 have not been announced, but have been forecast in the region of KWD80 million (USD285 million). This comes on top of more than USD275 million in losses in FY2010-2011 and around USD180 million the year before. The carrier is saddled with a major burden imposed on it by its ageing fleet. It operates five A300-600s, three A310-300s, three A320s, four A340-300s and two Boeing 777-200ERs. Most of its aircraft are close to 20 years old. The ageing fleet imposes a heavy maintenance burden on the carrier; it is only able to keep 10 to 12 aircraft operational at any one time. The Jul-2012 grounding of five aircraft also highlighted number of operational and staffing issues, as well as resulting in a significant amount of bad press for the airline. Competitors like Jazeera Airways and the Gulf carriers have younger, more fuel efficient fleets, allowing them to undercut Kuwait Airways on fares. Repeated attempts to replace the aging aircraft have run afoul of political interference. The carrier faces stiff competition in the local and regional markets, which have largely passed Kuwait Airways by over the past decade. Compared to full-service competition like Emirates, Qatar Airways or Etihad Airways, and the leisure focussed flydubai and Air Arabia, the airline is undersized, undercapitalised and operates outdated equipment with below-par services levels and product. Kuwait adopted an open skies policy in 1996, aimed at promoting the development of aviation. While the policy has seen traffic double between 2003 and 2011, Kuwait Airways feels this has led to some foreign competitors dumping excess capacity in the market - a not uncommon reaction from previously protected flag carriers. When the low-cost Jazeera Airways was launched in 2004, Kuwait Airways also lost its local monopoly. Jazeera offers a hybrid product to appeal to Kuwaiti travellers and the airline has successfully captured a segment of both the business and high-end leisure markets. In 2010, faced with local oversupply (the entry of publicly listed Kuwait company, Wataniya Airways operated briefly, targetting the higher yielding market between 2009-2011 did not help), rising fuel prices and stagnating passenger levels, Jazeera radically restructured, cut its fleet and capacity by almost 50% to allow it to operate profitably. It is an example Kuwait Airways has appeared either unwilling or incapable of following. Kuwait Airways now has just a 23% share of seats at Kuwait International Airport – down from more than 30% in 2008. Its long-haul profile is however reflected in its higher - 35% - share of capacity (in ASKs) at the airport, thanks to its connections to Europe, Southeast Asia and North America. While the national carrier handled 2.8 million passengers in 2011 with a fleet of 17 aircraft, upstart Jazeera Airways managed to handle 1.2 million with a fleet of only six. With its short-haul focused network Jazeera Airways operates a little under 12% of seats in Kuwait, but just 7.5% of capacity measured by ASKs. The Gulf sixth freedom carriers have also made significant inroads into the market. 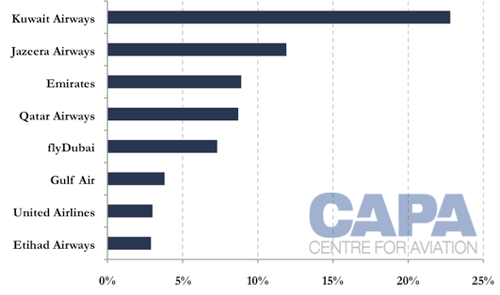 Emirates and Qatar Airways both have better than 8% of local seats and around 4.5% of ASKs. Despite the open skies policy, Kuwait has slowly fallen behind other Middle Eastern hubs in terms of traffic, a trend not helped by the state of Kuwait Airways. A decade ago, the airport was handling similar amounts of traffic to Doha and Abu Dhabi. With their ambitious governments and fast-growing local carriers, these hubs have now far outstripped Kuwait. Other hubs with strong ambitions such as Muscat and Amman are now also beginning to close in on Kuwait in terms of passenger traffic. Kuwait Airway’s on-again, off-again privatisation saga has carried on for the better part of a decade. Various privatisation schemes for the airline have been mooted since the mid-1990s. In 2004, the airline was restructured into a corporation as part of a dual bid to prepare for privatisation and prepare it for the liberalisation of Kuwait’s aviation sector. The present scheme was launched in 2008, with legislation passed setting an objective of completing privatisation by 2010. 35% of carrier was to be sold to either a local or international core investor. Another 40% would be sold to Kuwaiti citizens via an IPO. A 20% strategic share was to be retained by the government, with 5% to go to an employee share ownership fund. Numerous issues have plagued the process, including a drawn-out valuation and the sensitive political issue of transferring the employment of government personnel from a public to private enterprise. Both have now been resolved, the latter by guaranteeing that employees will either be reassigned to equivalent seniority similar government positions or receive healthy payouts. In late 2010, with the process in danger of going off the rails completely, the Kuwaiti government brought in several major investment banks to help put the process back on track. Even with their help, the deadline was pushed back to Mar-2011. A halt was called in Oct-2011, when the Kuwait government suspended the privatisation, to focus instead on addressing a “number of operational and structural issues”. Given that the privatisation was already well behind schedule and had failed to attract any serious investors, the move was unsurprising. The regional political and social unrest exposed the carrier’s structural problems and labour issues have rumbled through 2010 into 2012. In 2011, the Kuwait Airways privatisation committee attempted to dress up the carrier’s privatisation as a “compelling investment opportunity”. To sweeten the deal, it offered incentives such as fuel discounts, an exclusive government business contract and control of the lucrative ground and cargo handling business at Kuwait International Airport. Kuwait Airways announced in Jan-2013 that it plans to acquire around 20 aircraft to replace its fleet. In the short term, the carrier will look at leasing five to ten new aircraft to replace some of its aging fleet. It confirmed in Oct-2012 that it is in negations with several leasing firms. Another major problem is that the carrier is heavily overstaffed, with almost 5000 employees for less than 20 operational aircraft. In comparison, Jazeera Airways, with a fleet of seven much younger A320s, employs less than 500. Despite the size of its workforce, Kuwait Airways has reported shortages of trained technical staff as it struggles to keep its fleet operational. Kuwait is a wealthy country, with a per capita GDP of nearly USD44,000 and sits on 7% of the world's oil reserves. In these terms it is theoretically well equipped to deliver the sort of comprehensive economic and aviation strategy that the UAE carriers have been able to. That it has not is testimony both to the vision and commitment of the UAE governments and to the absence of those characteristics in Kuwait. The Kuwaiti market generally still has major barriers to foreign investment. Legislative barriers have been removed for most sectors, but any specific transaction is still tied to other legal and social provisions. A US government analysis reports the local business culture is “heavily based on clan and family relationships that often preclude foreign participation”. The country has been judged by the World Bank as the Gulf region’s most difficult to do business in. In 2010, Kuwait country received just USD81 million in foreign direct investment. The uncertainty of the regulatory and political environment regarding the carrier is also a concern. Kuwait Airways has been a political football for a number of years, with continuous poor relations between the Kuwaiti National Assembly and the executive branch. The Assembly has consistently blocked the airline's re-fleeting efforts in 2007, issuing a number of allegations regarding corruption at the airline in the ensuing years. 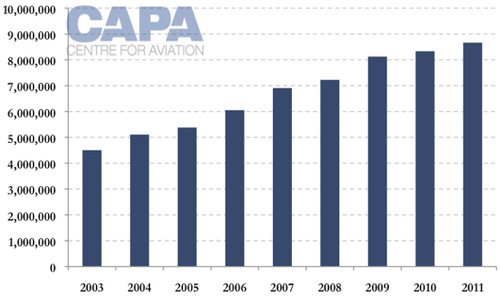 There is also the issue of airport capacity constraining growth. Kuwait International Airport is the country’s only sizable airport and despite upgrades in 2001 and 2008 it has been operating at or above its design limits for the best past of a decade. Passenger numbers in 2012 are expected to be close to nine million, well above the design capacity of seven million. The local aviation market is not without its upsides though. The country’s open skies agreement gives plenty of scope for expansion of Kuwait Airways’ networks. With the influence of the robust oil sector and continuing high prices accounting for almost 100% of the country's income, Kuwait has few economic challenges. Demographically, it enjoys a comparatively youthful and expanding population. There is also a significant expatriate population in the country, with correspondingly high travel volumes. To provide a solution to the capacity problem, Kuwait has announced a plan to invest up to USD6 billion in a multi-phase airport development programme for Kuwait International Airport. Initial development plans would increase capacity to 13 million passengers p/a by 2016, keeping the airport just ahead of growth projections. The second phase is planned to lift this to 25 million p/a by 2025. The project will ultimately increase the capacity of the facility to 50 million passengers p/a. Kuwait has ambitions to join the rest of the Gulf in the regional aviation boom, and for that it feels it needs a revitalised national carrier. In 2010, the country unveiled a tourism master plan and has been investing to revamp its airport and travel industry. Despite this, and the country’s open skies policy and general liberalisation of the aviation market, Kuwait’s travel market has been eclipsed by its Gulf state neighbours. Kuwait has a population of just 3.7 million – 1.4 million national and 1.3 million expatriates - but still needs strong local airlines. The government’s preference is for a strong national carrier to support the strong local travel market, as well as business and tourism travel to the country. Given an upgraded airport hub with adequate capacity for expansion, a properly restructured and financially solvent Kuwait Airways with a cut-down workforce and a revised fleet would provide a compelling investment opportunity. But even with the improving outlook, Kuwait Airways will need a radical transformation if it is to become an attractive target for investors. The privatisation legislation calls for the loss-making carrier to be privatised in three years. The flag carrier faces a challenging - but, with the right support a quite achievable - journey if it is to make itself an attractive investment target within that time frame.